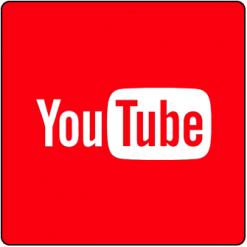 For the purpose of transparency, this hands-on was completed using a code provided by the company or their respective PR company. 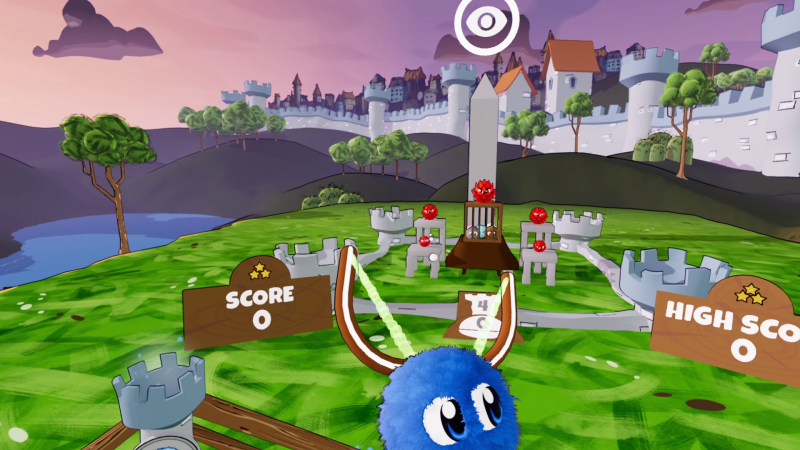 The use of a free code does not affect my judgement of this product..
VR Furballs – Demolition comes to both the HTC Vive and Oculus Rift in Early Access, but what exactly is VR Furballs – Demolition? When I first booted up VR Furballs – Demolition and started playing it what came to mind was Angry Birds. Even then I understood why Gamily Studios would take this approach, at the end of the day Angry Birds is one of the most popular games to come out on mobile. 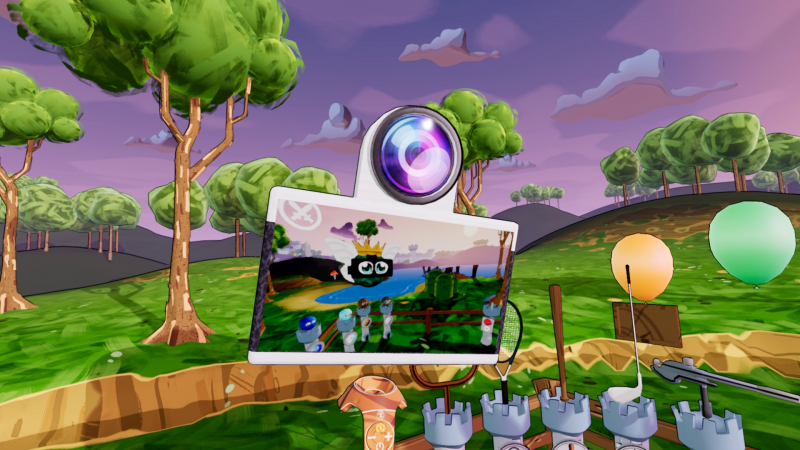 However, as you delve deeper into VR Furballs you realise it is so much more than a VR Angry Birds. So, let’s have a look at why. The game has a slight story to it, but this seems more to just give the game its aim. Basically the mean Red furballs have taken some of your more cute furballs captive. It is now your job with the help of some friendly furballs to take these out and save the others from the furry hands of your enemies – well I say hands they technically don’t have any. That is the premise of the story/aim of game, simple but that is all it needs. 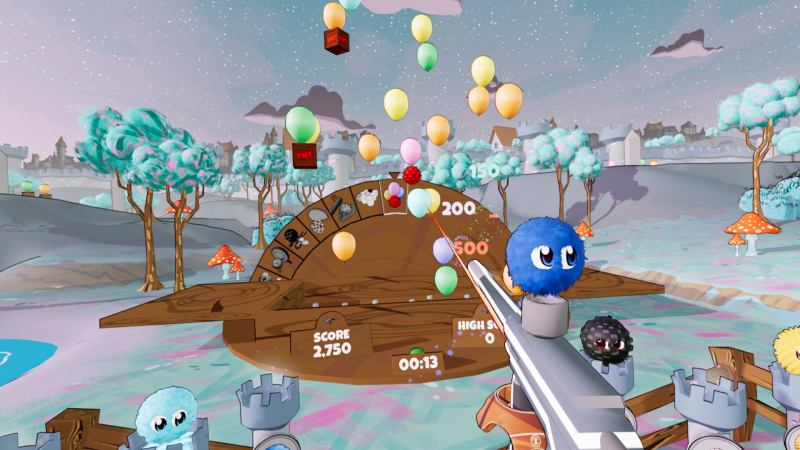 Yes, the above aim is very much the Angry Birds vs Pigs scenario, but the gameplay is where the VR Furballs opens up into it’s own. There is many ways in both forms of weapons/tools and types of furballs that can be used to complete the levels. Firstly let’s have a look at the weapons and tools that the game puts at your disposal. Overall you will be able to unlock six weapons and six tools. The weapons range from a sling shot you a gun, each weapon handling differently outside of the tennis racket and baseball bat. Don’t get me wrong you can just throw these furballs – but where is the fun in that?. I personally found myself using the sling shot the most, but if you are up for a challenge the tennis racket and baseball bat is where it is at. Now, the tools are there to help with some of the weapons and also help you out in set situations. The drones are the most useful tool you will get, with one set to launch the furball into the air for you to hit with the tennis racket or baseball bat. Others at your disposal are mushrooms that can make you grow or shrink, at times this can you give you an advantage on the battlefield and reaching some of the more well hidden evil red blighter’s. Add to the mix the different type of furballs, which are used for a different type of object that could be blocking your view/shot. For example the first types you receive outside the standard furball is ice and concrete. The ice is light blue indicating it is for the ice objects also light blue, but fire one of these at a concrete block it will just ricochet back – this is where you will use the grey (concrete) furball. Meaning in order to rack up those high-scores you really need to think of the best way to proceed. Each level will give you a set amount and a mix of the types of furballs to co-inside with the objects placed around the level. You are given these is set order outside of your control – this brings in some tactics in order to complete it with the least amount of furballs used. Add to these plans the types of weapon and/or tool you want to use and it really opens the game up for a choice of how you personally want to approach it. As well as unlocking the levels as your progress you will also unlock a number of mini-games in the process – six to be precise. These will range from target practices, basketball and whack-a-mole. Again as with the levels you can choose any of the weapons you have unlocked to play these. Meaning it’s down to you how hard you want to make them, I personally found basketball with the golf club was a nightmare. 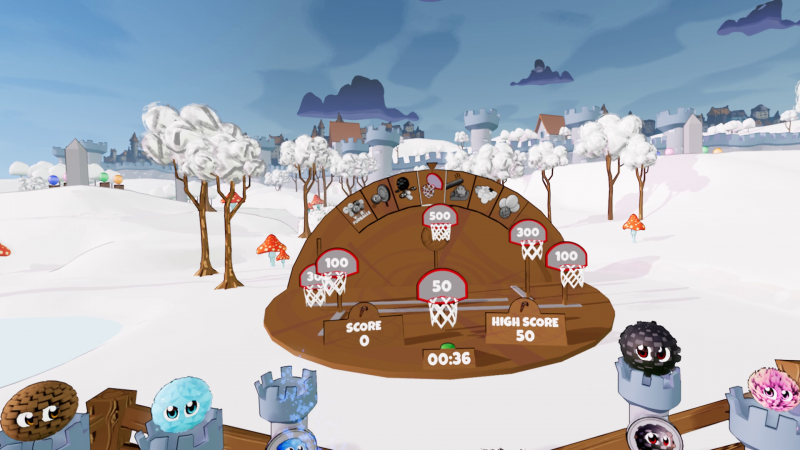 At the moment the game comes with twenty-four levels while in Early Access, with more being unlocked though its development (fifty-four in total). Each of these levels come with a three star rating system, and to get all three stars in them can be quite a task. Add to this the many different ways you can approach the levels and the mini-games, it opens the game up to a lot of playtime. The steam page suggests 1-2 hours but I have probably spent that much time playing the mini-games alone – never mind the twenty-four levels (I have still yet to complete). They have also added a photo mode into the game, that will allow you take screenshots of the game, but the traditional mode for taking screenshots is also available. If you needed more reasons to go back than the fun the game offers, it also includes online leader-boards for the competitive players out there. Not only does it include the leader-board for overall scores, it also has separate ones for each weapon, meaning there’s plenty of goals for you to aim for. I have tried both the HTC Vive and Oculus Rift versions of the game, and both have run very smoothly without any hick-ups. But, if you are playing on Oculus I would recommend booting the game from Oculus Home rather than Steam VR because it did suffer a slight slowdown at times via Steam VR. 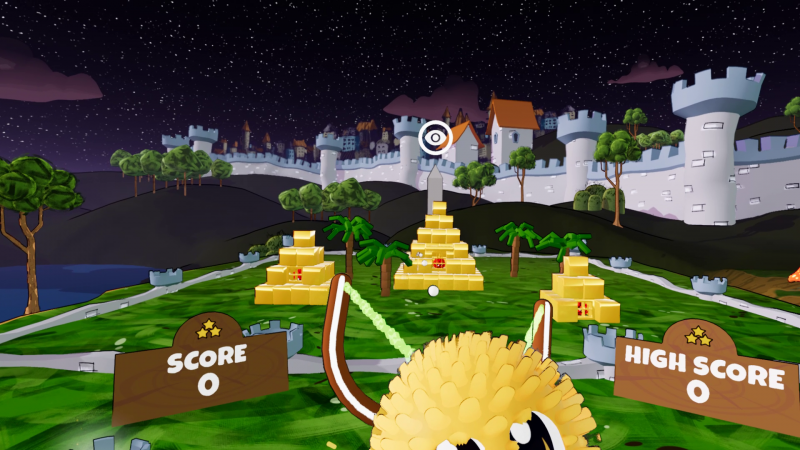 VR Furballs – Demolition comes from a small studio, who clearly have put a lot of heart into this game and it shows. Bringing with a game that is in the same ilk as Angry Birds but offers so much more. Even in Early Access with less than half the planned levels you will keep finding reasons to go back and continuing your play, be it the trying to get the allusive three star ratings, the mini-games and topping the leader-boards. As the game continues it’s development it is only going to get better, do yourself a massive favour and grab this title – for only £3.99 ($4.99 USD) it’s going to cost you less than a McDonald’s or a coffee, and will last you a lot longer and give you more enjoyment for your money.